Turkish cavalrymen advance through an Armenian village. Armenia­: Russians recapture Artvin on Upper Chorok. 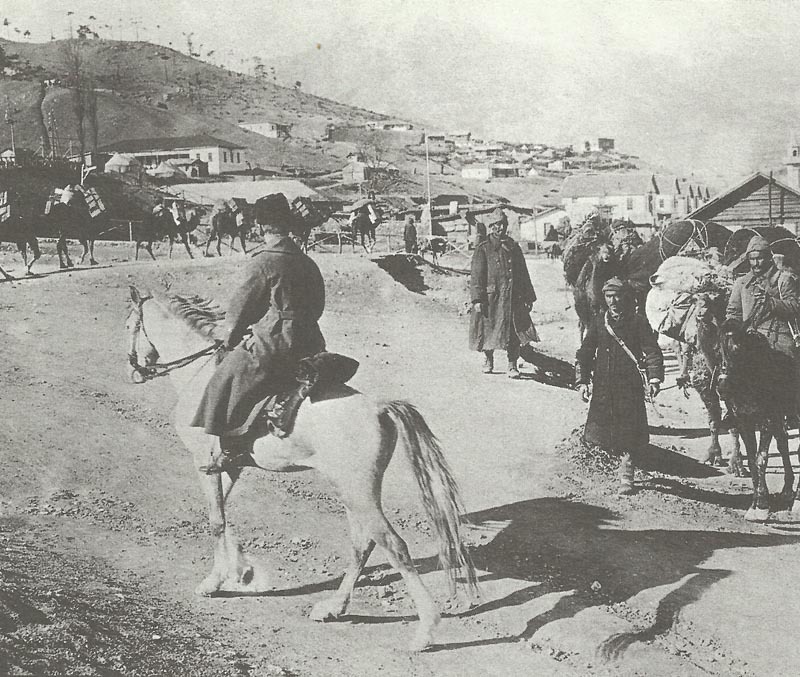 Turks evacuate Batumi on March 29. Mahmud Kamil Pasha replaces Hasan Izzet Pasha as C-in-C but keeps same German CoS, Major Guse (for duration). His Third Army reinforced to 35,000 men. Egypt: Royal Navy Division, French Division and 29th Division landing to re-stow equipment until March 29. Meuse: French advance at Les Eparges and repulse counter-attacks next day. Atlantic: Last German surface raider sinkings of British ships until January 11, 1916. Dardanelles: No 1 Kite-Balloon Section RNAS ordered to Dardanelles aboard ex-dredger Manica. Arrives at Mudros on April 9. Austria: Government makes Trentino territorial concession to Italy. Britain: Press campaign starts on munitions shortage with Field Marshal French’s statement to The Times. Germany: Tirpitz contacts Kaiser’s doctor to explore his Crown Prince Regency idea. Turkey: Law for Encouraging Industry.